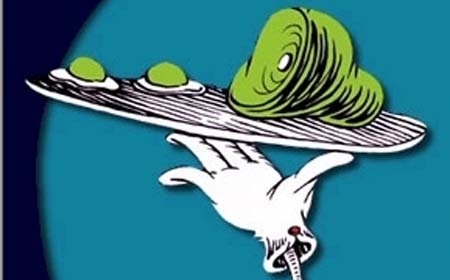 Green Eggs and Ham is a much-loved children’s book written by Theodor Seuss Geisel in 1960, the book is so loved in fact that is was the 4th best selling children’s book of all time in 2001. Green Eggs and Ham begins by showing a young fellow bothering an older gentleman while he tries to read his paper. The bothersome chap’s name is Sam as he so eloquently indicates with a sign stating “I am Sam” that he holds while standing on the hindquarters of a galloping dog-like creature. We then realize that such ridiculous behavior is not so ridiculous and that Sam is obviously mentally challenged as he makes another pass with a sign stating “Sam I am.” It is likely that Sam possesses a rare form of Dyslexia wherein he confuses the order and orientation of words rather than that of individual letters, another explanation could be simple insanity. Hollywood has clearly picked up on Sam’s mental state and has made a live-action motion picture based on it. The film is titled ‘I am Sam’ wherein the main character shares similar mental limitations to those of Sam in ‘Green Eggs and Ham’. Sam proceeds to ask Phil if he would like green eggs and ham in various locations with various different dinner guests, in a house, with a mouse, in a box, with a fox, etc. etc. etc. Eventually, Phil caves and agrees to eat the green eggs and ham but only if Sam will leave him alone. Upon tasting the food, Phil discovers that he likes green eggs and ham and he politely thanks Sam. So what is the message of all this? What is this Green Eggs and Ham trying to teach our children? First of all, it teaches kids to put rotten green food in their mouths…who has ever eaten a green egg and lived to tell about it? Perhaps little Jimmy is walking through the chicken house and finds an old egg that was missed in the hay 2 months ago. He cracks it open…Oh look! it’s green! Jimmy then recalls having this book read to him and proceeds to eat the aforementioned egg. Yes, not cool. The second message this book sends to kids is that it’s okay to give in to peer pressure. According to this book, when your friend is offering you something you’ve never tried before like illegal drugs, go ahead and try it. Because after all you might like it and your happiness and appeasing your (insane) friend is more important than your personal convictions, your physical health, or abiding by the law.